We usually think of driving as just getting from one place to another, hopefully fast and smooth. There’s periods in the long hours of driving when the scenery is interesting and beautiful, but most of the times it’s just the never ending road. 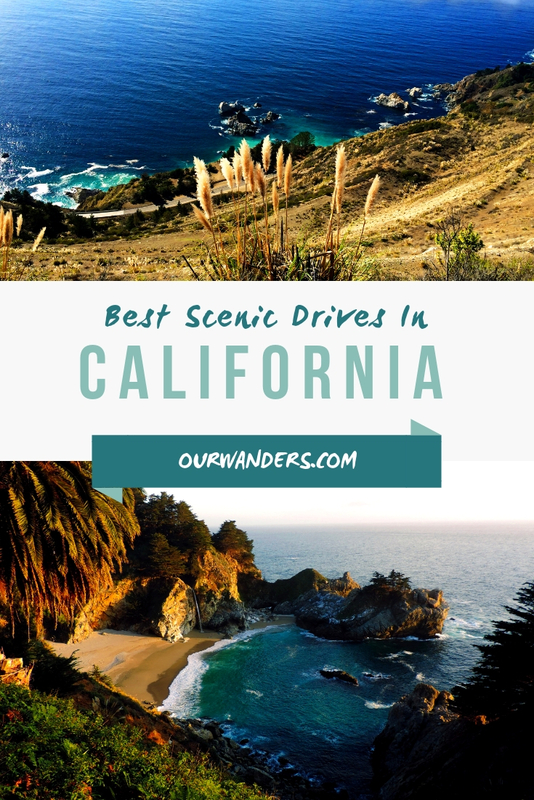 California was the first place which surprised us with such scenic drives that now we can believe that driving through a beautiful place can be a whole day activity with lots of fun. Not that it’s not unique and magnificent in a way that nothing else can be… it’s just too hot for hiking most part of the year and especially dangerous for hiking in the summer months. 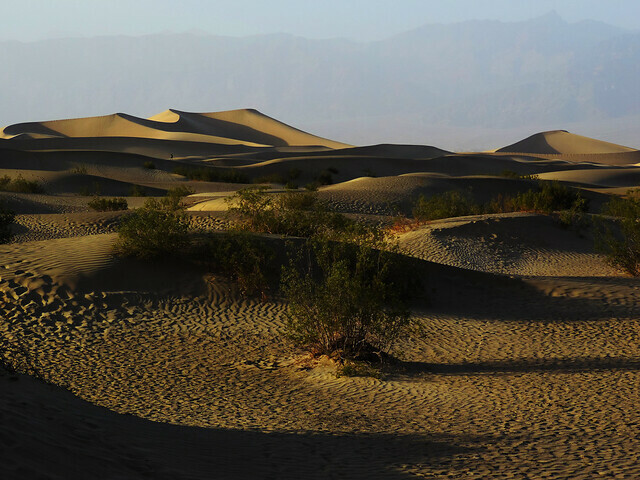 Death Valley holds the record for the highest reliably reported air temperature in the world after all (134 °F/56.7 °C). In spite of its not too tempting name (or maybe that’s what is tempting for you as it was the case with us: how could a place called Death Valley look like?) it’s a truly special park to explore. Route CA 190 goes through the park and there’s a lot of exciting vista points and stops along the way. As you think of a desert or a wild rocky place, you don’t expect much there other than… nothing. Just the wild scenery. 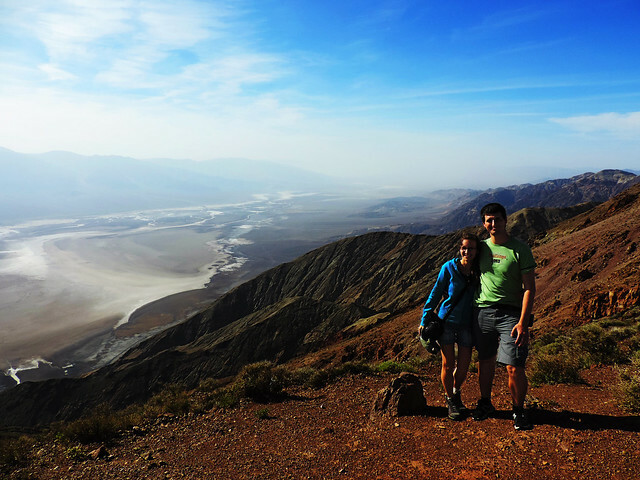 We were so surprised how varied Death Valley is! 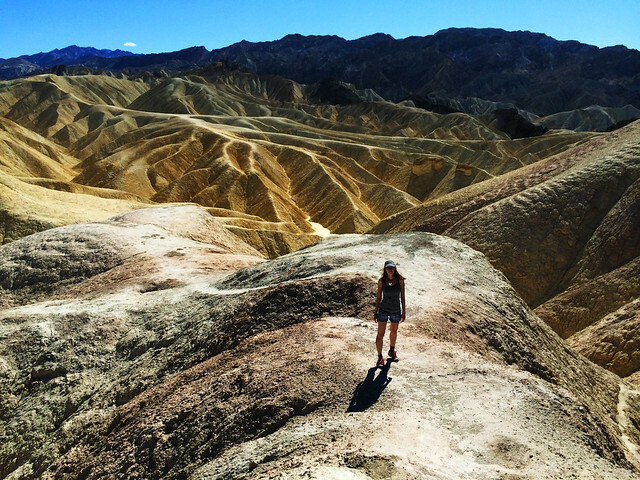 Half an hour drive from Zabriskie Point, Mesquite Flat Sand Dunes will make you feel like you got part of the Sahara next to the road just for you to see. Dante’s view (close to the east entrance of the park) is a short detour from route 190, but it’s worth driving up to the peak where you have a great view of the nearby mountains and you can also look down onto the salty plain of Badwater Basin. 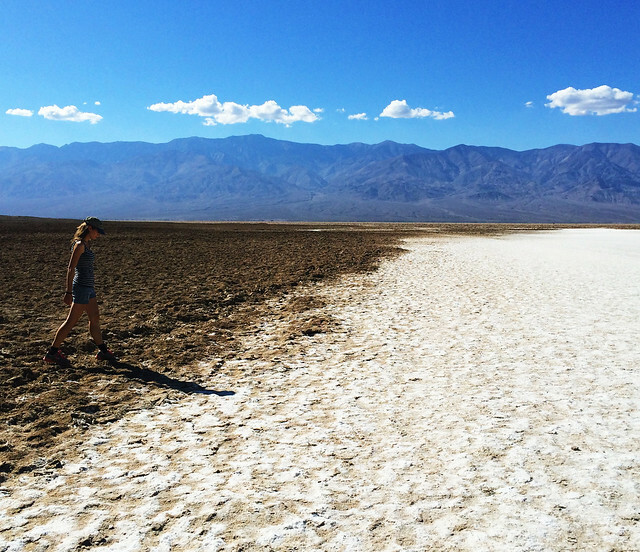 Badwater Basin is the lowest and hottest area of the park. Experiencing that dry and hot air when you really need a liter of water for a 20 minutes walk was so unique! You don’t want to spend much time here, but that 10-20 minutes will be very special. 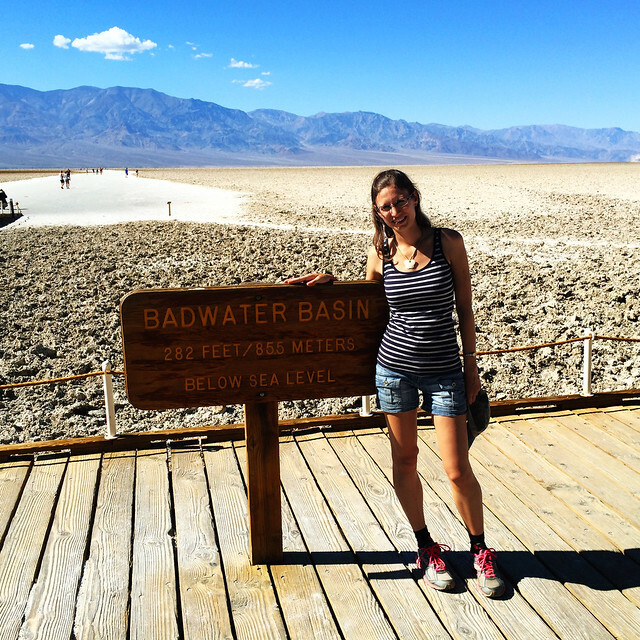 It’s not directly along route 190 though, you have to turn onto Badwater Road for a 40 minutes detour, but it’s definitely worth it! Just don’t go in the summer or during the winter storms. We were there once in October and once in May and I can tell you, you can experience the extreme heat in autumn and in spring, too, and you can avoid the risk of the most extreme summer heat. Highway 1 offers a different kind of beauty: beauty of the blue ocean, music of the waves, dolphins and whales jumping out of the water, seals lying on the shore. 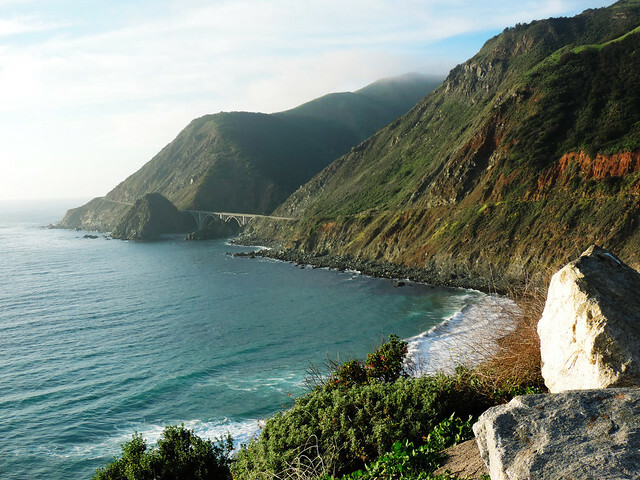 It runs along most of the Pacific coastline of California and it’s famous for its beautiful scenery. However, driving along the whole route is not a one day drive. 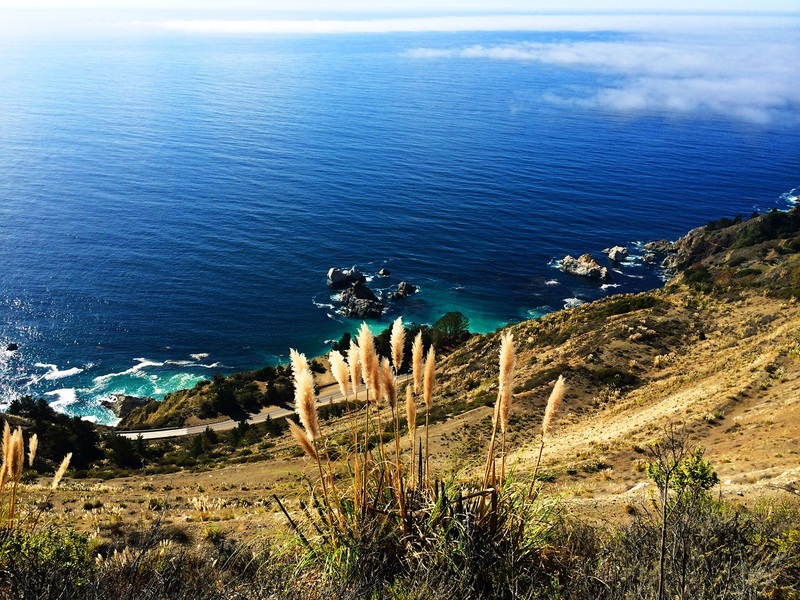 If you just want to see the best of it, start at Monterey and drive down to Ragged Point along the Big Sur coastline. Of course, there’s a lot of pullouts and vista points along the way, so whenever you are tempted to stop to enjoy the view, you’ll easily find a place to do so. That’s what we did all day long: get in and out of the car, because the views were so incredible that we barely started driving, we had to stop again. 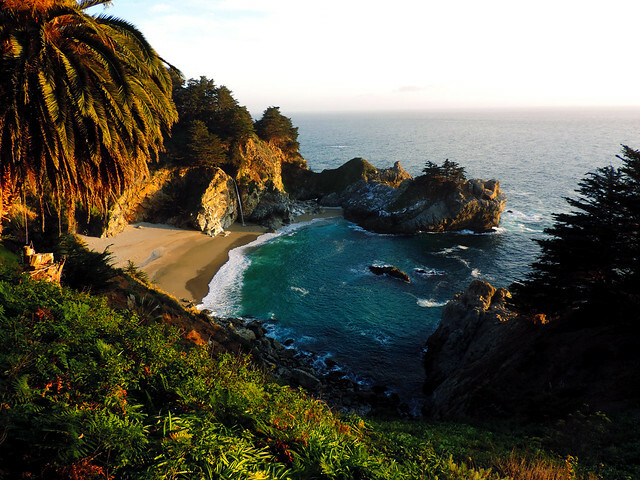 There’s one place we definitely recommend you to stop for a short walk: McWay Falls. 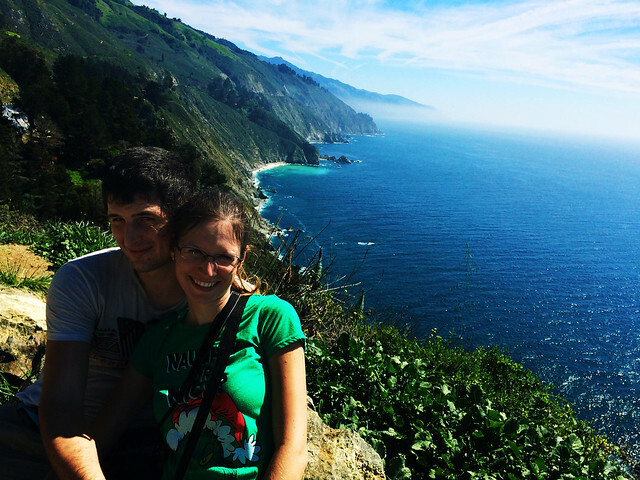 It’s in Julia Pfeiffer Burns State Park, but you don’t have to drive in the park, you can also park on the pavement of Highway 1 and walk about 5 minutes to see this charming little bay with it’s pretty waterfall which looks like a perfect painting – my favorite bay at California’s coast. 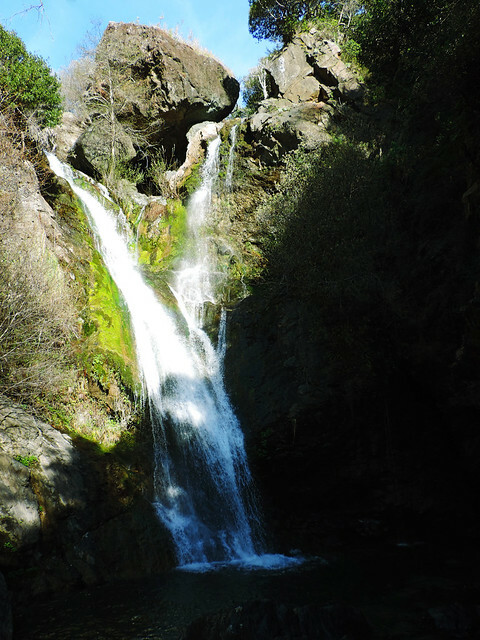 Salmon Creek Falls just a bit north of Ragged Point is also worth a 10 minutes hike. It’s less popular and also less crowded than McWay Falls – yes, it doesn’t have ocean view and it’s also not falling into the ocean as McWay Falls, rather it’s a hidden fall in the forest. We could actually see the top of the falls from the road – then we just parked at a pullout and found the sign indicating the trailhead. Sadly, we think of this very special forest drive with disappointment, because it was pouring rain all day long when we were there. After we got completely wet during our morning hike in the redwoods, we didn’t even get out of the car along Avenue of the Giants. 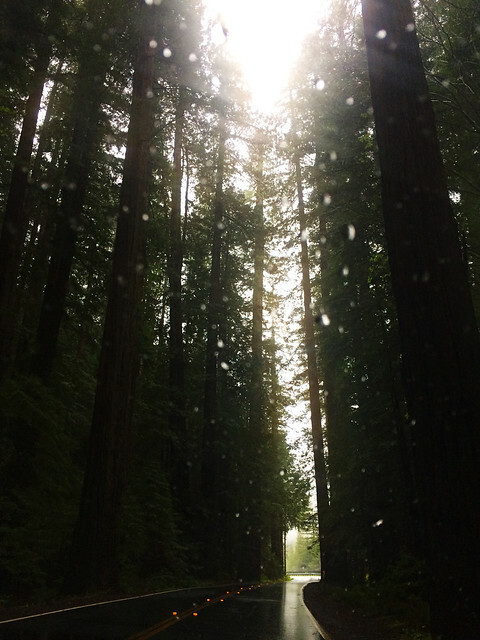 But it was so impressive simply driving through this forest of giant redwoods! 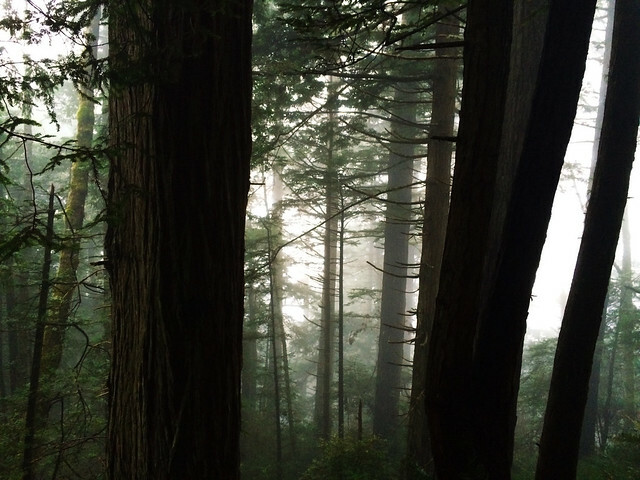 These are the tallest trees on Earth! That’s one thing I felt small in this forest, but I also felt that our car is incredibly small compared to the trees right next to the road. There was tons of places where our first thought was: ‘Oh, if the rain will just stop for a short time, it would be so nice to have a picnic here!’. We should definitely go back to this park again to see the sun glowing through the crown of the Giants. Do you have a favorite scenic drive anywhere in the world? Wanna start planning now? Start looking for rental deals as well in advance as you can!